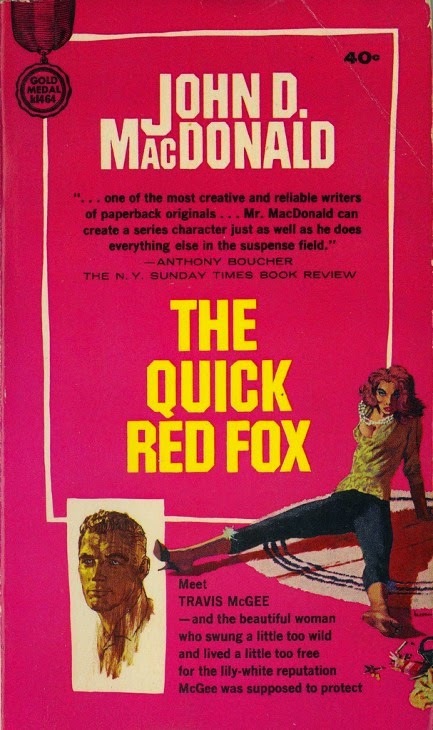 When John D MacDonald began his writing career in October of 1945 he embarked on a marathon stay in front of the typewriter, working in a converted closet of a small, second story apartment in Utica, New York. He wrote 80 hours a week and produced 800,000 words of prose, most all of it rejected by the magazines of the day. Eventually, with the exception of two stories that were published without pay in a marginal periodical, his first real sale happened in February of the following year. It was also at this time that the MacDonald family -- John, Dorothy and eight year old Johnny -- made their first trip south for a brief stay in Florida. It was John’s first ever visit to the Sunshine State. Back in New York and fearful of running out of money John took a day job with the Taxpayer’s Research Bureau, a decision he came to regret as his stories began to sell in greater quantity. As an excuse to quit he claimed that Dorothy’s health could not withstand another upstate winter and he needed to take her south. He quit the job and the family got in the car with a trailer in tow and headed for Taos, New Mexico. Although he’s never explained why Taos was the family’s destination, it was probably because of the location of the Taos art colony there. With both adult members of the family now expressing themselves artistically, it would only seem logical for them to commune with other artists. This same rationale led them to eventually move to a college town outside of Utica, then to the artists' community in Cuernavaca, Mexico, then ultimately to Sarasota. They never made it to Taos. They got as far as Ingram, Texas, located in the hill country northwest of San Antonio, fell in love with the surroundings and rented a cheap, off-season cabin on a hillside. They stayed there the winter and early spring before returning to New York. 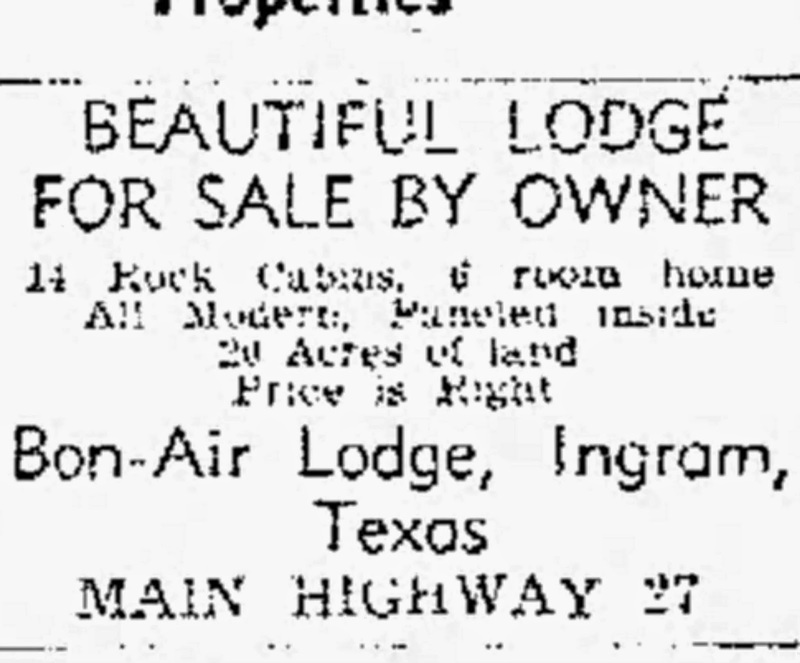 There is relatively little written about the family’s stay in Ingram. In The House Guests MacDonald himself gives the place all of one sentence, and both Merrill and Hirshberg are both just as brief. 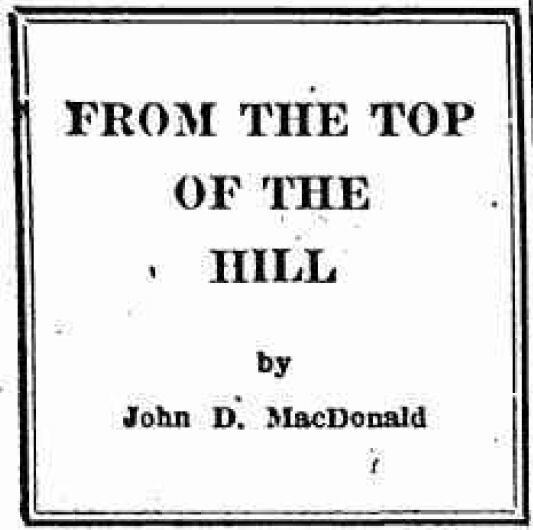 But in December of 1947 MacDonald wrote a more detailed account, in his weekly Clinton Courier column titled From the Top of the Hill. It appeared in the December 4 issue of the paper. Merrill writes that MacDonald produced only fifteen stories during the stay in Texas, and indeed when one looks at his chronological listing of published works it can be seen that there is a definite falloff in magazine appearances during this period, if not production. Assuming a one month lag, there were only two stories published in March, one in April, two in May and two in June. One of those stories was “The Pay Off,” sold to Cosmopolitan, only his second sale to a “slick” and probably the source of one of his “substantial” checks awaiting him in Utica. The Bon Air Lodge was sold in 1951 and continued to operate for awhile before disappearing into history. The MacDonalds don’t seem to have ever returned there. 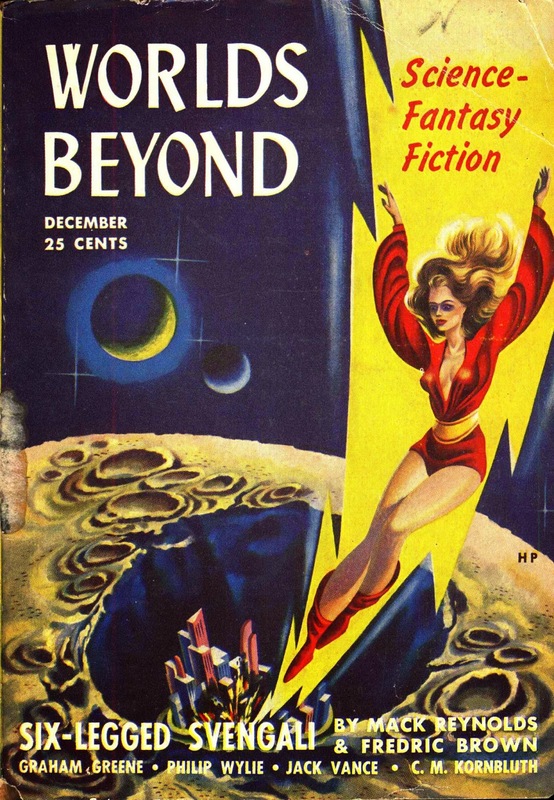 Worlds Beyond was a monthly science fiction digest that began life in the relatively late year of 1950. Published by Hillman Periodicals and edited by the inestimable Damon Knight -- late from his stint as assistant editor of Super Science Stories -- the magazine made its debut in December with an issue that contained both new and reprinted stories. Knight's mission statement appeared on the inside of the back cover, where he proclaimed a different kind of sf: Science Fantasy Fiction. ... [it's] a blend of two forms of imaginative writing: science fiction and fantasy. Fantasy is as old as recorded history; science-fiction is a child of the industrial revolution. For years these two branches of the field have been considered as separate, but the old standards no longer apply: a fusion has taken place. The "pure" science-fiction story is almost nonexistent; it has acquired the flavor and the freedom of fantasy. "Pure"fantasy is equally doomed by the new attitudes and knowledge that science has introduced; but at the same time the principles of science-fiction writing have give it new life. The hybrid... is as strongly alive as any form of modern fiction. It's our aim to do everything possible to strengthen it further and to aid its growth. You won't find "wiring-diagram" science-fiction stories here, or Gothic horror-fantasy either. But the whole field in between is our meat -- and, we hope, yours, too. The setting is certainly Bradburyesque, a small Midwestern town on a bucolic summer evening. There was a blueness in the sharp-edged shadow cast by the Fire House, a blueness that hinted of dusk. There had been a piece in the Cardon Gazette about the man over in Chamber County who claimed to have seen a flying saucer. Through the heat of the long Saturday afternoon the front of the Fire House had been the focal point for the saucer discussion. Men came and went all afternoon and the talk at times grew as hot as the sun against the pavement and store front across the way. As the day wears on and participants come and go, dusk begins to settle and the group is down to five men and a boy. Hobe Traik, one of the old timers, has been uncharacteristically quiet throughout this Saturday discussion, leaning back in his kitchen chair, “his belly resting comfortably against his beer-keg thighs, his store teeth clamped into the deep grooves of the pipestem, a mist of sweat gleaming on his bald head.” But when he does finally speak he commands attention as he recalls a Saturday from the distant past that began right in front of the same Fire House. "Now I've heard a lot of fool talk today about these here saucers. Might be I'm a little tired of it. Me, I've been a-waitin' on them for just about forty years. Ever since Woolmutt left town..."
Woolmutt is shy about entering and elects to go last in the bout he eventually competes in. And of course, his spitting is nothing like rolling dust along a dry small town street. "First thing I see, he sticks his tongue out. Now I tell you, boys, that was the biggest tongue I ever did see on anybody. He sticks it straight out, flat like, and then he curls it up from the sides to make a sort of tube. That tube is a good four inches out beyond the end of his stubby little nose. I see him take a breath. Big chest on the little fella... He goes whih-THOO! And something goes bang across the street..."
There’s a hole in the plate glass front of Winkelhauer's Merchandise Mart. The crowd roars, and some are suspicious. He is checked to make sure there is no foreign object in his mouth, and when none is found, a second round commences. This time Woolmutt hits the wall just below the store window. The third and final round ends with Woolmutt hitting one of the pine blocks used to mark the contestants’ places in the dust, sending it reeling across the street. 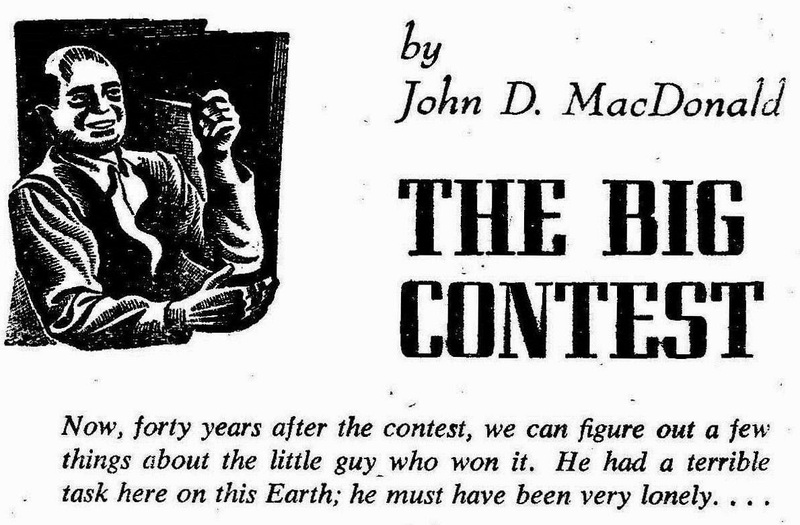 “The Big Contest” is run-of-the-mill John D MacDonald and run-of-the-mill JDM science fiction, a fairly predictable tale with a surprise ending that will surprise no one, and a style that proves that MacDonald was no Ray Bradbury. The homespun dialogue comes off as overly arch and his evocation of a rose-colored past is told with none of the poetry that Bradbury did effortlessly. 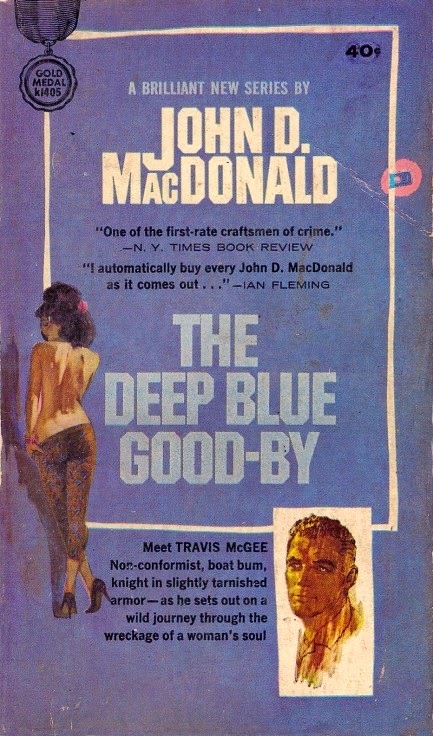 MacDonald was the master of a different kind of poetic prose, one that expressed itself in what it didn’t say, in brief sentences and dialogue that allowed the reader’s imagination to take over and fill the void. 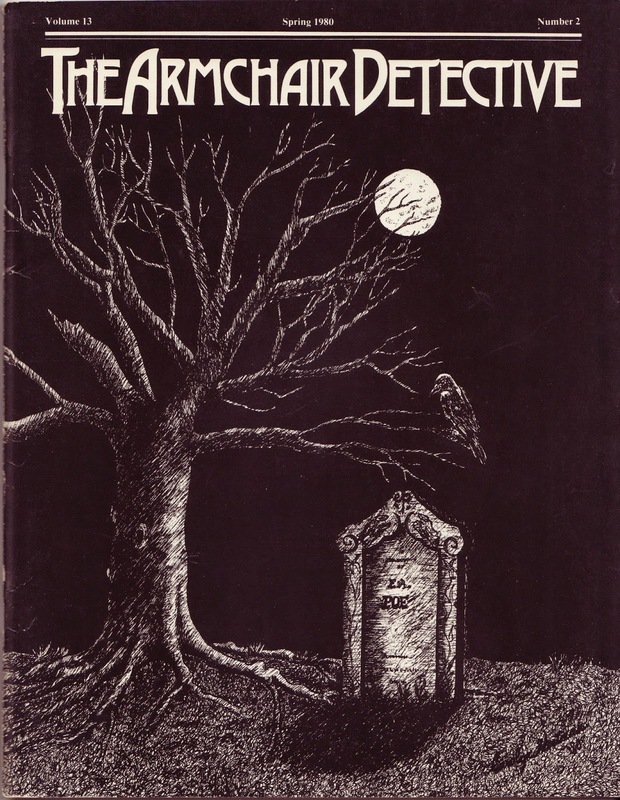 Of course I have no idea if MacDonald was channeling Bradbury in this story, but he certainly was a fan of the writer, even going so far as to have his first-person character in Dead Low Tide make a direct reference to him. 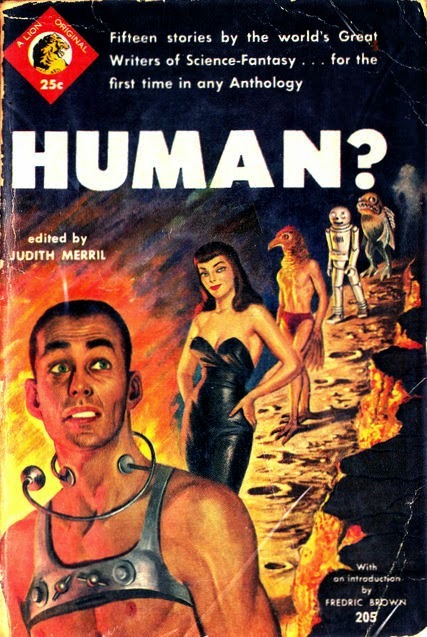 Judith Merril liked “The Big Contest,” however, and included it in one of her early anthologies, Human? in 1954. 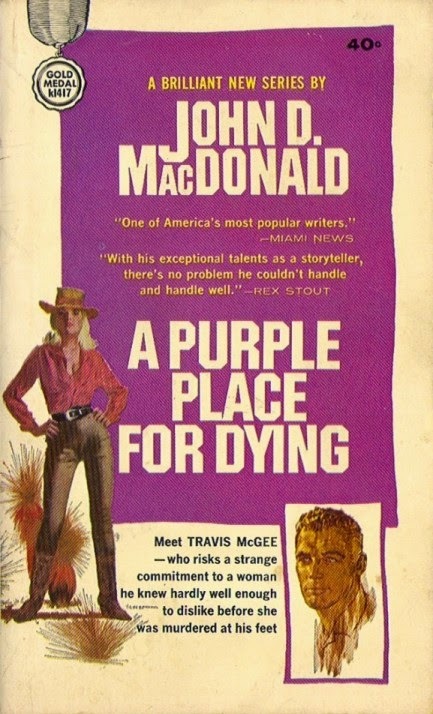 Several of the authors featured in this first issue of Worlds Beyond got brief biographies on the inside of the front cover, MacDonald included. (Except for the back cover there was no advertising in the magazine.) It is fairly typical of the bio he supplied all of the magazines who requested one during this period. John D MacDonald, tall, bifocaled, 34, lives winters in Clearwater, Fla,. summers at Piseco Lake, N.Y., with wife and boy, 11. His background of Harvard Graduate School of Business Administration and the wartime O.S.S. has not contributed much to the whodunits, science-fiction and adventure yarns which have enabled him to keep eating since 1946. He can't save money, lay off smoking or stop falling hair. He has a detective novel soon to be published. That novel was his first, The Brass Cupcake, which had already hit the stands in October. “The Big Contest” also appears in MacDonald’s own science fiction anthology, Other Times, Other Worlds, which is out of print and still not available as an eBook. Write your congressman!